Want a pickup that's loaded with personality? The Rams are as big, bold and in-your-face as the people who like driving them. With a standard 345-horsepower HEMI V8, the Ram 2500 is one of the most powerful pickups in its class. When equipped with the Cummins Turbo Diesel, the Ram can tow up to 16,300 pounds. Powertrain is the best I've seen in years. I've recently had trouble with the air conditioner which I replaced with new blower, I am overall satisfied with the performance as far as power, which is a very important thing when I go to pass a car on the highway or even cross railroad tracks and or going through stop signs. As far as the reliability I have not one complaint, it has never left me on the side of the road, and I have not been late to work since I bought it. Now for the comfort it provides, it is by far the best truck I have ever had as far as being comfort, with more room than one needs, and that really helps when taking trips to visit with family. Our Dodge double cab dually has been reliable from the time we bought it in 2008 until 2018, this year. It has never had any serious problems but it doesn't have as smooth a ride as other vehicles we've owned. Also we have had problems with the air conditioner for the last few years. Overall it is a good dependable pickup that I could recommend without hesitation. 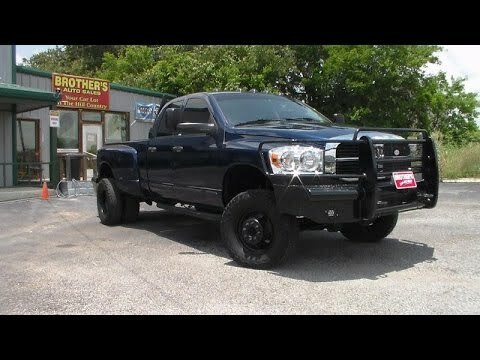 2007 Dodge RAM 3500 mega cab. Air conditioner is not working but the engine runs and pulls my trailer good. The radio is excellent. Good sound. Seats are very comfortable. Have the mega cab and there is a lot of room in the cab for the whole family. Have the six speed manual transmission and enjoy it. No issues with transmission. ON CERTAIN PASSENGER AND SPORT UTILITY VEHICLES AND PICKUP TRUCKS EQUIPPED WITH AUTOMATIC TRANSMISSIONS, THE SOFTWARE PROGRAMMED INTO THE POWERTRAIN CONTROL MODULE CAN CAUSE A MOMENTARY LOCK UP OF THE DRIVE WHEELS IF THE VEHICLE IS TRAVELING OVER 40 MPH AND THE OPERATOR SHIFTS FROM DRIVE TO NEUTRAL AND BACK TO DRIVE. IF THE DRIVE WHEELS LOCKED UP, LOSS OF VEHICLE CONTROL COULD OCCUR INCREASING THE RISK OF A CRASH. DEALERS WILL REPROGRAM THE POWERTRAIN CONTROL MODULE FREE OF CHARGE. THE RECALL IS EXPECTED DURING SEPTEMBER 2006. OWNERS MAY CONTACT DAIMLERCHRYSLER AT 1-800-853-1403. CERTAIN TRUCKS FAIL TO CONFORM TO THE REQUIREMENTS OF FEDERAL MOTOR VEHICLE SAFETY STANDARD NO. 111, "REAR VIEW MIRRORS". THE RIGHT OUTSIDE REAR VIEW MIRROR GLASS HAS A CURVED (CONVEX) MIRROR GLASS INSTALLED INSTEAD OF FLAT GLASS. CURVED GLASS CREATES A WIDER VIEW, BUT DISPLAYS IMAGES FURTHER AWAY THAN THEY ACTUALLY ARE. DRIVERS OF LARGE VEHICLES MAY HAVE DIFFICULTY JUDGING DISTANCE RELATIONSHIPS, WHICH COULD CAUSE A CRASH WITHOUT PRIOR WARNING. DEALERS WILL REPLACE THE RIGHT OUTSIDE CONVEX MIRROR GLASS WITH A FLAT MIRROR GLASS FREE OF CHARGE. THE RECALL IS EXPECTED TO BEGIN ON OR BEFORE OCTOBER 9, 2006. OWNERS MAY CONTACT DAIMLERCHRYSLER AT 1-800-853-1403. ON CERTAIN TWO WHEEL DRIVE TRUCKS EQUIPPED WITH MANUAL TRANSMISSIONS, THE FRONT DRIVESHAFT YOKE MAY BREAK UNDER CERTAIN DRIVING CONDITIONS. THIS COULD RESULT IN A LOSS OF VEHICLE CONTROL AND CAUSE A CRASH WITHOUT WARNING. DEALERS WILL REPLACE THE DRIVESHAFT FREE OF CHARGE. THE RECALL IS EXPECTED TO BEGIN DURING SEPTEMBER 2007. OWNERS MAY CONTACT DAIMLERCHRYSLER AT 1-800-853-1403. CHRYSLER IS RECALLING 1,364 WINDSHIELD WIPER MODULES, P/N 55077098AJ, SOLD DURING THE 2008 AND 2009 CALENDAR YEAR FOR USE AS AFTERMARKET REPLACEMENT EQUIPMENT ON MY 2002-2009 DODGE RAM PICKUP TRUCKS. THESE WIPER MODULE ASSEMBLIES MAY BE SUSCEPTIBLE TO WATER INTRUSION THAT COULD RESULT IN PARTIAL OR COMPLETE LOSS OF WINDSHIELD WIPER CAPABILITY. WHEN THE WIPER SYSTEM FAILS, THE OPERATOR WILL HAVE REDUCED VISIBILITY WHICH COULD RESULT IN A CRASH. DEALERS WILL REPLACE THE WIPER MODULE ASSEMBLIES WITH VENTED WIPER MOTOR HOUSINGS FREE OF CHARGE. THE MANUFACTURER HAS NOT YET PROVIDED AN OWNER NOTIFICATION SCHEDULE. OWNER MAY CONTACT CHRYSLER AT 1-800-853-1403. CHRYSLER IS RECALLING 108,429 MY 2007-2008 DODGE RAM 2500 AND 3500 PICKUP TRUCKS EQUIPPED WITH 6.7L DIESEL ENGINES. A SILENCER PAD CAN SAG AND CONTACT THE EXHAUST GAS RECIRCULATION (EGR) COOLER. THIS COULD RESULT IN AN ENGINE COMPARTMENT FIRE. DEALERS WILL ADD A BRACKET TO SUPPORT THE ENGINE COMPARTMENT SILENCER PAD ADJACENT TO THE EGR COOLER. THE RECALL IS EXPECTED TO BEGIN DURING DECEMBER 2008. OWNERS MAY CONTACT CHRYSLER AT 1-800-853-1403. E-N-G MOBILE SYSTEM WILL NOTIFY OWNERS AND THE VEHICLES WILL BE REPAIRED BY CARRIER FREE OF CHARGE. PLEASE SEE CARRIER'S DEFECT REPORT 09E-053. THE SAFETY RECALL IS EXPECTED TO BEGIN DURING DECEMBER 2009. OWNERS MAY CONTACT CARRIER AT 1-877-584-7059 OR E-N-G MOBILE SYSTEM AT 925-798-4060. CERTAIN LKI ENTERPRISES, INC., BRAND NAME SUPERLIFT SUSPENSION, PITMAN ARMS SOLD AS REPLACEMENT EQUIPMENT FOR 2003-2007 DODGE RAM 2500 AND 3500 4X4 LIGHT TRUCKS. DUE TO INADEQUATE HEAT TREATMENT DURING PRODUCTION, THE AFFECTED PITMAN ARMS MAY DEVELOP CRACKS IN THE UPPER SPLINED ATTACHMENT ATTACHMENT TO THE STEERING OUTPUT SHAFT. MOVEMENT BETWEEN THE PITMAN ARM AND THE OUTPUT SHAFT MAY DEFORM SPLINES, RESULTING IN PREMATURE WEAR AND FATIGUE FAILURE OF THE AFFECTED PITMAN ARM. PITMAN ARM WEAR OR FAILURE MAY LEAD TO LOSS OF VEHICLE CONTROL, POSSIBLY RESULTING IN A VEHICLE CRASH. LKI WILL NOTIFY OWNERS AND REPLACE THE PITMAN ARM, IF NECESSARY. THE RECALL IS EXPECTED TO BEGIN DURING FEBRUARY 2007. OWNERS MAY CONTACT LKI AT 1-800-551-4955. CHRYSLER IS RECALLING 18,000 AFTERMARKET STEERING LINKAGES USED FOR SERVICE ON SOME MY 2003 THROUGH 2008 DODGE RAM HEAVY DUTY PICKUP TRUCKS. THE SUBJECT LINKAGES MAY EXPERIENCE DRAG LINK INNER TIE ROD TO PITMAN ARM BALL STUD FRACTURE, ALSO, THE STEERING LINKAGE DAMPER ATTACHING BRACKET MAY YEILD AND SHIFT ON THE LINKAGE. THE PART NUMBERS OF THE AFFECTED ASSEMBLIES IS 52122362AA THROUGH 52122362AD. THIS COULD RESULT IN A LOSS OF STEERING CONTROL AND THE RESTRICTED ABILITY TO TURN THE VEHICLE IN ONE DIRECTION INCREASING THE RISK OF A CRASH WITHOUT WARNING. DEALERS WILL REPLACE THE STEERING LINKAGE DRAG LINK INNER TIE ROD END ASSEMBLY, AND INSPECT THE STEERING LINKAGE DAMPER BRACKET FREE OF CHARGE. THE RECALL IS EXPECTED TO BEGIN DURING JANUARY 2009. OWNERS MAY CONTACT CHRYSLER AT 1-800-853-1403. ON CERTAIN CAB/CHASSIS PICKUP TRUCKS EQUIPPED WITH AN OPTIONAL 23 GALLON FUEL TANK, THE FUEL TANK STRAPS WERE IMPROPERLY MANUFACTURED AND COULD SEPARATE. THIS CAN CAUSE THE FUEL TANK TO LOOSEN AND LEAK FUEL. FUEL LEAKAGE IN THE PRESENCE OF AN IGNITION SOURCE CAN RESULT IN AN UNDERBODY FIRE. DEALERS WILL REPLACE THE FUEL TANK RETENTION STRAPS AND FASTENERS FREE OF CHARGE. THE RECALL IS EXPECTED TO BEGIN DURING NOVEMBER 2007. OWNERS MAY CONTACT DAIMLERCHRYSLER AT 1-800-853-1403. Broken springs can result in a no-start condition, or cause unintended movement when the ignition is cranked, increasing the risk of a vehicle crash. Chrysler will notify owners, and dealers will replace the clutch ignition interlock switch, free of charge. The recall is expected to begin February 13, 2015. Owners may contact Chrysler customer service at 1-800-853-1403. Chrysler's number for this recall is P80.